A very familiar trio is standing in front of the mansion. Megumin, Alice, and Yunyun, huh. Their ages are pretty close, so they must find it easy to get along. The fact that she’s playing around in Axel probably means that her business as the princess must be concluded. Seems like Megumin and Alice are quarreling, and Yunyun is trying to stop them. Poking my nose into the middle of a quarrel between women never results in anything decent. I’ll just pretend I didn’t see them and pass by. I made shooing motions at Yunyun who approached me with teary eyes. The power of Megumin’s explosion is certainly something to behold. The royalty of this country are rumoured to be pretty strong thanks to the blood of heroes flowing in their veins. I thought it was a pretty good idea myself, but it seems like Yunyun disagrees. Perhaps hearing Yunyun and me quarrel soothed their anger, but Megumin and Alice turned away from each other. Apparently, Megumin had an errand to run or something, for she wandered off somewhere else, but Alice walked over to me. She was staring directly at my waist for some reason. Even though she’s royalty, she’s honestly apologizing. That’s quite impressive. Normally, nobles and royals would never admit their mistakes, instead stomping off back home to make some unreasonable demands. I thought that was the end of our conversation, so I moved to leave, but Alice jogged up to me and pulled on the sleeve of my shirt. She actually went and thanked him in person? … I miscalculated. Given her personality, it would’ve been natural to expect her to do that. I waved my hand without turning around and left the place without saying anything. There’s no need to confirm or deny that. As long as it was a happy memory for Iris, that would do just fine. I declared as we were having a meal at the guild. My companions froze for a moment, but resumed eating their meals after giving me the barest hint of a glance. I’m not one to be so easily discouraged. I stared at the ceiling, grabbed the hilt of my sword, and launched into a fervent speech. I personally thought that was pretty good. I’m a little concerned over the silent reactions of my companions, so I lowered my gaze… To find all three of them silently eating their meals. These guys… They saw through my perfect strategy! I tried to put into action one of the tips for raising affection that I came across in one of the books I read at the general store, but it didn’t have any effect at all. Dammit, it’s because you stock such useless books that your store isn’t crowded. That old man really should treat his work more seriously. Saying that, I energetically slammed the request against the table. After confirming the contents of that quest, my companions turned to look at me with doubtful eyes. Keith exasperatedly and repeatedly slapped the request. Taylor didn’t say anything, but he nodded along. It seems like he shares their opinion. My companions discussed amongst themselves. I was similarly confused when I first got the information, but everything clicked together the moment the guild gave me the name of the requestor. Lynn instantly caught onto it, whereas Taylor and Keith still seemed a little confused. Come to think of it, Lynn experienced Darkness’s… peculiarities first hand, but Taylor and Keith have yet to see her in action. I wouldn’t mind enlightening them, but Taylor does look up to Darkness as a fellow crusader. There’s no particular pressing reason to shatter his illusion of her. There are quite a few adventurers who remain ignorant of her true nature. They’ll probably fall into despair if they learn of it. Actually, yeah. I didn’t think too much about it because she’s a pervert, but… What exactly is she going to do after getting her hands on a live giant frog? When we eventually met up with Kazuma, it seems like it’s the first time he’s heard about this request, so he called Darkness out to give her a lecture. 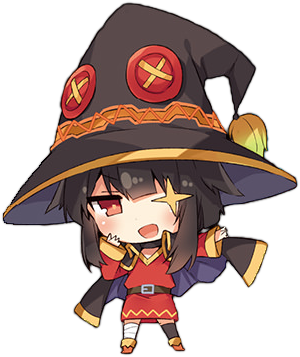 She tried to keep a straight face while spinning all kinds of incomprehensible excuses for Kazuma, but receiving Kazuma’s scoldings just seems to make her more excited. This girl is absolutely beyond help. The quest was retracted, but we did receive a cancellation fee. I guess it’s not too bad to live seriously every once in a while. <And that’s it for Dust 3. I hope you enjoyed reading it. Unfortunately, similar to Dust 2, I wasn’t able to get my hands on the other short stories, so this is the only short story from this volume that will be placed up. As usual, I’ll be taking a few weeks break to finish up the rest of volume 15. The tentative release date would be 28th December, though I’m considering pushing the day I release chapters to Saturday for logistical reasons. We’ll see how things go when I get around to it. I’ll also be putting up the Dust 4 Drama CD sometime between the break to make up for the lack of short stories, so look forward to that as well.And of course, you’ll be able to access my works a week in advance through my patron. Next ›Dust 4 Drama CD: Cleaning up after this Masked Devil, Subbed! Thanks for the translation I really enjoy reading konosuba works. Oh, seems like Iris has a pair of good eyes. She even realize that Dust is not used to sword previously as well. Well done, princess. Dust has become my new favorite character. He has changed a lot from volume 1. I can’t wait to hear the exact background story of Dust and the other girl of which we have yet to discover the name of.